Bristol manufacturer Bailey goes head-to-head with budget brands in 2015 to prove that an entry-level four-berth can provide comfortable caravanning. Bailey launched its entry-level Pursuit range in October 2013, to replace its Orion and Olympus ranges. The Orion was known for its radical and trendy bodyshell, with a radiused front and rear, but it missed a trick in failing to offer layouts that were suitable for large families. The Olympus was a narrow-body tourer aimed squarely at newcomers to caravanning. As a result, the Pursuit was packaged to offer buyers the best qualities from both ranges. 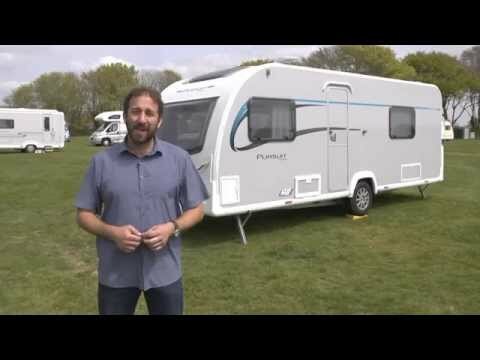 Like all touring caravans and motorhomes produced by Bailey, the Pursuit range is built using Bailey’s Alu-Tech system, and has tough GRP-skinned walls. At 2.23m it’s wider than the Olympus was, and its grey sidewalls and white front and rear panels help it to stand out against a sea of all-white tourers on forecourts and campsites. Here are some of the key facts and figures for the 2015 Bailey Pursuit 550-4. The shipping length is 7.38m; tyres are 185 R14 LI04N. If you're tall, you may like to know that the interior height is 1.96m. The overall external height (including aerial) is 2.61m. And the thermal insulation is EN1645 Grade 3. The perfect tow car partner for the Pursuit 550-4 would have a kerbweight of 1616kg (for an 85% match). The 550-4 has what is very much one of the must-haves layout of the moment: twin single beds and an end washroom in a four-berth tourer that rides on a single axle. This layout is popular with couples and families of four alike, because it offers real flexibility: adults who prefer to sleep separately can take the twin single beds while younger kids share the large made-up double bed in front; or if the kids are no longer prepared to share, they can occupy the single beds. We’ve been running the Pursuit on our test fleet for 12 months and, over the following pages, we round up the verdicts from all of our testers in this fond farewell to it. The front and rear panels take their styling cues from the Orion, with rounded sections where they meet the roof. Bailey says these substantially reduce drag and, therefore, improve fuel economy on tow. the rear nearside single bed), an exterior door flyscreen, a microwave oven and a radio/CD/MP3 player with iPod connection, at a cost of £399 and a weight penalty of 38kg. The Al-Ko Secure wheel lock and ATC trailer-control system are also available as options, but were not fitted to our van. One interesting and unusual external feature is the relocation of the gas locker from the front of the tourer to the offside. Bailey has done this to reduce the noseweight and to make for better stability when in transit. And the Pursuit does indeed behave beautifully when being towed. What you do get at the front is a pair of small, plastic-lined corner lockers, which are ideal for levelling blocks and the like. The handbrake is gas-assisted to make applying it easy, but the button-release mechanism demands a little strength to operate. The A-frame fairing has step-on pads to make for easier cleaning of the window and the panels above it. Setting up on site is otherwise a breeze: there’s a groove in the sills to access the winding nuts of the front steadies, and although the rear ones are tucked beneath the bumper, it’s moulded in way that directs you straight to the nuts. The battery box, which also houses the mains inlet point, is in a nearside locker and, towards the rear, there’s an external access hatch to the storage space beneath the nearside single bed, which is fitted with a handy plastic tray. On the offside, the gas locker is slightly forward of the axle; the aperture is narrow and the cylinders are lined up, with one behind the other, so you’ll need to remove the first in order to replace the second. The drain taps are together to the rear of the axle as well and are equipped with rigid pipes. A Truma Ultraflow water inlet point is also here. Access to the Thetford cassette is via the van’s rear panel. The toilet has a separate flush tank to which you may add chemical additives. The grabhandles are fitted horizontally to the rear wall. Some of our testers argued that manoeuvring the van side-to-side or forward-and-back would have been easier had the handles been at an angle or vertical. With the large single front window, typical of entry-level tourers, the optional opening sunroof (£356) and a Heki rooflight, the lounge is certainly bright. A deep, full-width shelf beneath the front window conceals a slide-out occasional table and a drawer. Just beneath it is the easily accessible mains RCD unit, which is hidden behind a flap. Unusually for a caravan sporting a sunroof, the Pursuit is fitted with an overhead locker that stretches right across the front. The absence of a central chest between the facing sofas of the lounge leaves more space for seating and, although the offside sofa is the shorter of the two, they’re both long enough for feet-up lounging. Both sofa backrests have a backboard to separate them from the GRP interior walls and thereby reduce the likelihood of condensation building up in cold weather. and bring together oatmeal-coloured squab cushions with backrests, bolsters, scatter cushions and curtains that are all in a rich shade of copper. Heating comes courtesy of Truma’s dual-fuel Combi heater. It is operated via the manufacturer’s latest CP+ control panel, which features a rotary knob and digital display, and is so much easier to use than Truma’s previous arrangements. In the lounge, you’ll find a single heating vent and just one 230V socket fitted in opposite seat boxes. Some of our testers commented that they’d have liked to see an extra mains socket or TV aerial on the front shelf. The only TV point is on the small dresser to the rear of the entrance door. The lighting provided in the lounge is fairly minimal – a single ceiling light and just two rollerball-style reading lights beneath the overhead lockers – however these are enough to illuminate the area at night. We were also pleased to see that the rollerball lamps were of the LED style, so they don’t become hot to the touch. All the windows get blinds and flyscreens as standard, while the lower half of the stable-style entrance door is fitted with a moulded waste bin so narrow it is all but redundant. Drop-in carpets are provided throughout the Bailey, and those in our test model were velcroed to the floor rather than being held in place by press studs, which is far more common. At mealtimes, you’ll need to retrieve the freestanding table from its dedicated storage space in the wardrobe, which is in the washroom. This forces you to walk the full length of the van to retrieve it. At 85cm x 53cm, it is just about big enough for four diners. Two circular spotlights illuminate the galley when you flick the switch, which is tucked beneath the worktop. It took some of our testers a long time to find it! The worksurface is a good size, but storage space is a little squeezed, because the offside gas locker eats into space that would otherwise have been occupied by cupboards and shelves. There a cutlery drawer beneath the worktop, and a cupboard beneath the combined oven and grill. A circular stainless-steel sink is on the right side of the kitchen and a triangular, three-burner gas hob is just to its left. This leaves only enough space for the slim, crescent-shaped clip-on plastic drainer that is provided. Some of our testers complained that this was not large enough for a family of four. The microwave fitted in our van as part of the Premium Pack is overhead, above the sink and 1.55m from the floor. A Dometic 103-litre fridge/freezer completes the kitchen, and is faced with a walnut-effect panel to match the rest of the van’s décor. There are also two mains electric sockets tucked just beneath the overhead lockers. By siting the wardrobe in the washroom, floorspace is severely restricted. A small clear window and rooflight take care of ventilation. The toilet has an electric flush, and the two lights are operated by a pull cord just inside the door. The door has a domestic-style, locking handle, and two small clothes hooks are mounted on its inner face. The basin is rather low, with its lip at just 92cm from the floor. Interestingly, the swivel-head, electric-flush toilet is against the rear wall; this can only be accommodated because Bailey doesn’t cap its rear van wall, so the cassette toilet can be accessed here. The shower is generously sized and comes with an Ecocamel showerhead fixed in a high-level bracket rather than a riser bar, which would be prefereable. The shower has a folding, rigid partition door, and is lined with the same GRP featured throughout the rest of the van. The shower tray has a single plug drain, and a vent overhead. At night, the front lounge converts to either a double bed or a pair of singles. To make a double, the offside seat frame slides across the aisle to meet the nearside, and the backrest cushions drop into place. However, they make for a rather irregular-shaped sleeping surface, because the backrests are different lengths, which will make fitting domestic sheets over them a struggle. The sofas are longer than most in tourers with this layout, at 1.75m and 1.58m, respectively. This makes them a realistic solution for teens who would prefer twin beds over sharing a double. They’re both nice and wide, too, at 76cm. The rear, fixed beds are a little compromised: the offside mattress measures a decent 1.8m long and the nearside one is 1.9m, but both are just 68cm wide. There’s a 14cm ledge at the head of each that is about level with the mattress. It can be used as a shelf or to extend the bed. The beds are shielded from the inner walls by plyboard, which stops at mattress height. As a result, when sleeping in these narrow berths, you’re likely to come into direct contact with the GRP walls, which may become cold at night. The bedroom isn’t separated from the front lounge by a partition, which is often fitted as standard. Our testers called it one cost-cutting measure too far, although it’s available as an option (£82.37, plus fitting). We’d have liked to have seen a mains socket here, too. To sum up, here are the bed sizes – front double: 2.035m x 1.480m (6’8’’ x 4’10’’) or front nearside single: 1.775m x 0.750m (5’10’’ x 2’6’’), front offside single: 1.575m x 0.750m (5'2" x 2’6’’) and nearside rear fixed single: 2.035m x 0.715m (6'8" x 2'4"), offside rear fixed single: 1.925m x 0.715m (6'4" x 2'4"). Storage is pretty good throughout the Pursuit, including space under the fixed beds and the largely unoccupied front seat boxes. The offside sofa base rises on gas struts and is self-supporting when opened for easier access. The nearside sofa base can be lifted on springs, but cannot hold itself up. There’s no external access to either. The Truma Combi boiler is under the fixed offside bed, the base of which stays up when raised. The nearside fixed single bed houses the spare wheel and a useful wet tray, which can be accessed externally via a generous locker door. There are plenty of overhead lockers, but they lack both shelves and positive-locking mechanisms. The Bailey Pursuit 550-4 competes with the likes of the Xplore 574 from Elddis, and the Venus 550/4 from Lunar Caravans, so price and weight are crucial. The low weights, smart exterior looks, pleasant interior styling and acceptable equipment levels make the Pursuit 550-4 an appealing and very welcome addition to the budget market. Its lounge excels, which is unusual in this layout. It’s helped by the attractive front shelf/table unit and copious amounts of natural light that flood in. With good competition in the Xplore and Venus, this truly flexible floorplan for young families and couples alike has never looked more appealing.